The withdrawal of the 21B is no surprise really. If I'm being honest it missing out Mudge Way is more of an inconvenience than providing an 'Express' link to the City Centre. It has a bit of a strange running board aswell; I believe the 1720 21B from Royal Parade is board number 806 with a vehicle type of 'Volvo Double Decker', so clearly comes off a school run then commencing work on the 21B. 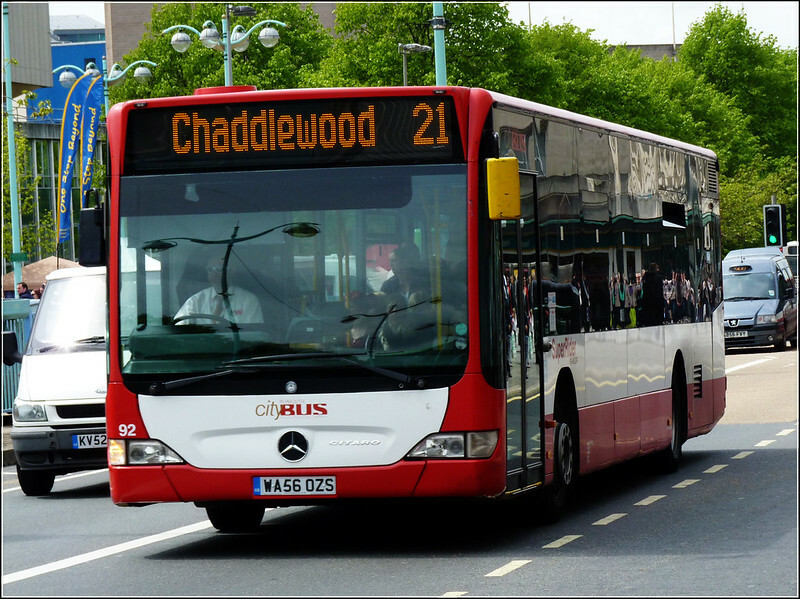 Though that same bus is used on the 42D during the day, as there was an Adult Single left on the bus on Friday (407), saying 'Adult Single' from Derriford Hospital to Chaddlewood Loop. Obviously the VDD wasn't available so a B7 was used instead, though it seems strange to assign a bus to a 42D, a school route, and then a 21B. The 1708 comes off the 115 and is also Volvo Decker operated. (184 was on this duty Friday). Back to the point, extra trips on the 21/A so it includes Mudge Way is more useful than the 21B. All the others are only minor changes so shouldn't prove too much of an issue. 43A time change is an issue. Will now cost me 30 minutes. No doubt changed to compete with evening 1/1A's. Not happy. The new look to the 21 timetable is a mixed bag for me. Shortening the stop names just makes it harder to read in my opinion, though top marks for marking on what journeys continue as a 26 - as a bus user in Plympton this is very useful! If only Citybus could do the same to the 42 & 20 timetable, as I know of a few people who have been caught out by getting a 42 at Derriford that starts its journey there, rather than Tamerton so doesn't change to a 20, catch it thinking it will, and end up stranded on Royal Parade waiting for a 20. What I think should be included in the next timetable change is a split on the 43Bs, similar to the 42/A. i.e. have one 43B an hour operate via St Budeaux & Milehouse, and one an hour operate via Crownhill Road, Crownhill, Outland Road and Milehouse to the City Centre. The latter (Crownhill - Outland Road - Milehouse - City) was the original plan for the new 42 though after the very first Plympton and Tamerton consultations this idea was scrapped before it went to print in the Herald that weekend so hardly anyone knew about it.The main reason I wasn't keen on this being the 42 was the loss of the 'Express'/quick link to Derriford to/from the City Centre; I can only assume other people said the same thing. A Crownhill - Outland Road - Milehouse - City route is much needed though; perhaps if not the 43B split idea at least one of the 40/41/44/44A. The 34 provides the Derriford Hospital - Crownhill - Peverell - Outland Road - Milehouse link. I think there's more market for the 42 to operate as it does via Mannamead and Mutley Plain. That's exactly what I thought and said to them back at their July consultations. The 42 is a definite no on operating via Outland Road, seeing as that link from Derriford is already as you say provided by the 34. The 34 though is not that frequent, perhaps introduce the Crownhill - Outland Road - Milehouse - City link on a 40 something so from Crownhill it can be timed every 15 mins to tie in with the 34. With the time changes to the 29, they really are keen on improving reliability on the 29 & 34 - in the evenings from Dec. 30th the 34 upon reaching Derriford now has a good 20 minutes before starting the 29! What I'd love to know is why the 34 from Estover Ind Est (1707) in the evening peak terminates at Granby Way - surely would it not be better to terminate at Milehouse or even Crownhill and upon reaching Crownhill pick up a 40 something down Mannamead & Mutley to shift a few people along this stretch? I don't know whether there is a market for a Southway or Whitleigh service operating via Outland Road. I think it's debatable as to whether that route is much quicker. If they wanted to increase capacity on this stretch then they could perhaps create a new route - going every 30 minutes from Derriford Hospital to the City Centre via Outland Road. This could combine with the 34 to give a 15 minute frequency on the Outland Road stretch. If they re-jigged the 42's they could create a 10 minute frequency from the Hospital to the City Centre instead of the current 15 minute service. However the route would need to serve somewhere north of Derriford. Instead of Southway or Whitleigh how about Woolwell going right to the old terminus at Pick Pie Drive? They could call it the 39. Or maybe they would look to run from Tavistock but I'd think they'd need more than 2 buses an hour to make headway on that route. ref the 43a, it seems to be no matter wot citybus do, someone gets upset about it. you cannot cater for every individual persons needs, so some people will be better off, some wont. end of story. Please, sort you spelling and grammar out before posting. This isn't Facebook! Whoops, your not you. To intent on trying to read the above message I totally forgot how to spell!! I think the 43A has been changed so all the 43 routes are more frequent. I believe this would change would lead to a bus leaving every 10 mins from A4. @ ExeterBusBasher,no, but it isn't The Telegraph either. There is currently a gap in the timetabled departures from Royal Parade with both the 43A and the 43B leaving at 10 and 40 minutes past the hour. If you add in the current 29 and 43 service departures you get a bus from Royal Parade to the Square at 05 10x2 15 20 25 35 40x2 45 and 55. No departures at 00 and 30. Moving the 43A to 00 and 30 cures this with a departure now every 5 minutes for most of the day. Departures from the 30th December on normal weekdays will be at 00 05 10 15 20 25 30 35 40 45 and 55. Makes perfect sense. I guess an oversight when the original changes were planned.